Trinidad Town Hall's big room gradually filled on the evening of Sept. 27 as residents of Trinidad, Westhaven and the Trinidad Rancheria drifted in. Members of the Humboldt Alliance for Responsible Planning (HARP), the organization hosting the meeting, kept adding rows of folding chairs to the audience area. After those were filled, people stood in the back. About 100 people had come to hear about and discuss the Trinidad Rancheria's proposed new six-story hotel. The Environmental Assessment (EA) for the project had just been made public a week earlier, surfacing by way of a Sept. 19 notice in the legal section of the Times-Standard. EAs are a type of preliminary document required by the federal government when federal agencies or funding is involved and there is the possibility of damage to the environment. Since the Rancheria is supervised by the Bureau of Indian Affairs, and the project has some possible environmental impacts, it is subject to this requirement. As a sovereign nation, the Trinidad Rancheria is not required to follow California's environmental planning laws but the federal environmental review process is roughly similar. An environmental report of any type is supposed to deal with a project that has been fully planned and is ready to be implemented, but as the evening wore on, it became clear that some parts of the project remain a moving target. EAs are designed to be brief documents, but this one is 473 pages long, stuffed with appendices of charts and technical jargon. The Bureau of Indian Affairs receives comments about the EA from the public for 30 days: it then decides whether a full-scale Environmental Impact Statement is required, or a simpler Finding of No Significant Impact will suffice. Usually a set of mitigations is required as well, that is, conditions that will diminish or eliminate any environmental impacts discovered. These possible mitigations were all detailed in the EA. One significant difference between tribal governments and their local and state counterparts is that because of their sovereign status, tribal governments are not required to follow California's Brown Act, the state's open-meeting law. A meeting of the board of supervisors or a city council must be open to the public except for a few well-defined circumstances. A tribal council, however, can exclude the public from its meetings. In 2009, the Rancheria hosted a series of public meetings about its future plans, including a possible 50-room hotel, RV park and gas station. Also in the works was a possible new offramp or freeway interchange directly connecting U.S. Highway 101 to the Rancheria. Not much was heard about the proposed project until April of this year, when the Humboldt County Association of Governments approved funding for Caltrans to do a preliminary study about the offramp. Some Trinidad and Westhaven residents became concerned about what they perceived as a lack of transparency surrounding the project and organized under the acronym of HARP. When the EA was released, HARP organized a public meeting. Several officials of the Rancheria were present: Tribal Councilmember Robert Hemsted; Government Affairs Coordinator Shirley Laos; Vice Chair Zack Brown; Secretary-Treasurer Katrina Mathison; and Interim Trinidad Rancheria Economic Development Corporation Director David Tyson. In addition, Fifth District Supervisor Ryan Sundberg attended the meeting, as did Fifth District Supervisor-Elect Steve Madrone, Trinidad Mayor Susan Rotwein and Trinidad Planning Commission Chair John Graves. The Rancheria plans to hold a Nov. 9 joint meeting with the Trinidad City Council about the hotel, but that is nearly three weeks after the Oct. 22 close of the Bureau of Indian Affairs' public comment period. David Hankin of HARP led the audience through the EA, step by step, beginning with the picture of a large hotel that has circulated on social media throughout Humboldt. He pointed out that the hotel is only one part of a larger master plan for the Rancheria, a plan that is only intermittently referrenced in the EA, making it hard to determine which environmental effects refer strictly to the hotel and which to the entire master plan. For the next hour, members of the audience lined up to give their input. Comments seemed to focus on four main issues. Visual impacts: As several members of the audience pointed out, Trinidad's draw to the tourist industry is its serene, undeveloped look, with one and two-story buildings scattered among the trees. A six-story glass building, visible from Trinidad Head and from the bay, would destroy this look, some said. Hankin pointed out that the few mitigations listed in the document seemed inadequate to mask a building of this size. Laos said that the picture associated with the EA was just an artist's concept made early in the development of the document and not really the way the project would look. However, she did not offer any alternative visuals. 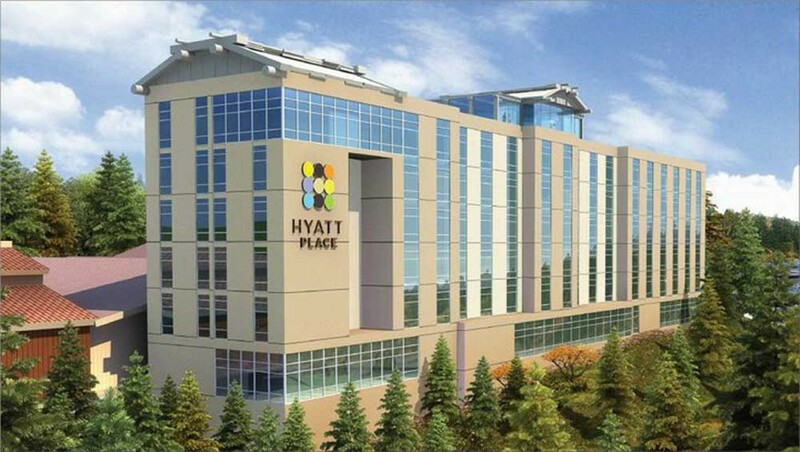 Tyson said the hotel's size was necessary to make the project economically feasible. Traffic: Called "dysfunction junction" by some locals, the gateway to Trinidad — an intersection of Main Street, Patrick's Point Drive, Westhaven Drive, the frontage road, two freeway on-ramps and two freeway off-ramps — is a challenge to navigate at the best of times. Only stop signs control the eight-road intersection, which often leaves tourists befuddled. The EA estimates that if the hotel and the accompanying project are built, traffic would be jammed unacceptably at the intersection. The plan proposes the above-mentioned freeway interchange as mitigation for these traffic problems. However, there is no guarantee when — or even if — the interchange will be built. Caltrans was only recently awarded money to study the need for the project and develop some possible alternatives for the interchange, meaning mitigations for the build-up of traffic caused by the hotel remain hypothetical. Even if the interchange is built, Caltrans' long project lead time would leave the traffic snarl unmitigated for years. Water: The document states that the hotel's water will be supplied by the city of Trinidad, which gets all its water from Luffenholtz Creek. The creek also supplies other nearby residences outside city limits, and its water is also piped north to the Cal Fire Station on Patrick's Point Drive. According to the EA, Trinidad has plenty of excess water. However, several audience members disagreed strongly with this statement. Jim Cuthbertson, a former Trinidad city councilmember who once served as the city's water commissioner and still regularly attends council meetings, said water security is an issue. "We were told the other night at a council meeting that we in Trinidad might have to go on water rationing because there's not enough water coming down," he said. "And if they do any building up above, they have the right and they can take more water ... They're worried about not enough water going under the bridge because they have a sensor there, and we could be in trouble." A 30-year resident of North Westhaven Drive said she has water problems all the time and had been advised by an expert to put water storage tanks in her backyard. "We've had drought years. We've had years when there was a leak in the [city's] tank when we did have to ration," she said. "You can look at this online. It would really be pushing Luffenholtz Creek to its capacity. I have very great concerns about this seriously threatening our water supply." Wastewater: City-dwellers are happily connected to their public sewer line and never have to think about where their wastewater goes after the toilet flushes or the sink empties. Rural areas, which make up of most of Humboldt County outside the larger towns, must take a different tack — the old-fashioned septic system, where wastewater ultimately ends up in a leach field, irrigating the weeds. Leach fields wear out, as many a rural homeowner has found out to his or her dismay, and must be replaced with another area of empty land. The Rancheria has worked to minimize the amount of wastewater generated in its casino, recycling a good percentage of the water used. But some of it still has to go through the septic system and the addition of a 100-room hotel could mean a significant increase in the amount of water entering the leach field. The EA document erroneously states: "the tribe currently uses city sewer connections as well as its own WWTF ..." In reality, the city has no sewer connections at all and its residents all use their own septic tanks. If the Rancheria's leach field fails, the bluff on which it rests could become destabilized, adding to the frequent failures of scenic drive just below. And land environmentally suitable for a leach field in the area is limited. The wastewater consultants recognized this problem. Senior engineer Nick Wiegel, who studied the wastewater issue, states in Appendix A: "I cannot stress enough the need to determine if there is additional dispersal capacity on the site and where this resource is on the Rancheria. The size and location of these areas will have a significant impact on the design and associated cost with the dispersal component of the system." Westhaven resident Don Allan summed up many of the concerns mentioned. "I totally support the rights of the Rancheria to have economic success and develop businesses that support Rancheria members," he said. "One thing that I am concerned about is the process. ... Just from the comments here tonight, it's obvious that there are some major concerns. ... There needs to be a lot more assessment and a lot more public input. ... We've had a lot of conflicting information about what's really being proposed, the interchange that's supposed to provide access to this hotel is not really part of this hotel, which confuses me, and those things do need to be assessed, because it's not just one thing. I've heard rumors about the gas station, the convenience store, the RV park. I think there's a lot of misinformation going around and I think that that needs to be clarified. "We need to know what the plan really is, and not just this one hotel," Allan continued. "Maybe this has been discussed for many years at the Rancheria. I don't feel that this has come forward to the public hardly at all. It's been difficult to get information." Allan said that he was not opposed to a hotel, provided that it is done tastefully and in a manner that fits into the landscape. Laos, speaking for the Rancheria, commented on the project's design. "The design isn't complete," she said, "and I've made extensive notes on what everyone has said. ... Our design isn't finalized yet. We're still working with our architect and our design team so many of these things that we talked about are already being discussed or can be inserted. ... Just because you see this big picture, which is more of a placeholder ... that was a very early iteration of what the hotel could look like, from our first developer's viewpoint. It's not what the final will be. ... I encourage everybody to make your comment on the EA. ... You can contact us at the Rancheria if you have specific questions." Dani Ferguson of Westhaven said she was relieved to hear Laos refer to the image as a placeholder. "I personally think a hotel up there could be a great asset," she said. "Keeping our bluff and our beauty intact, I'm sure is just as important to the Rancheria as it is to us, but that image that was put out by the BIA is scary. ... Having reassurance from the Rancheria that you want what we want, which is mindful design, would make it easier for us all to get aboard." Madrone thanked both the public and the Rancheria. "The Rancheria does a better job with water use than most of the rest of us," he said. "They reclaim a lot of water and re-use it again and again. We need to commend them for that kind of approach. ... They have been great partners with the community and the state. The only reasonably stable part of Scenic Drive is the part where the Rancheria expended a great amount of funds. ... I hope we can extend the time to figure out how to mitigate these [issues] in a way that works for the Rancheria." Hemsted, the tribal councilmember, said that he had previously heard a lot of misinformation spreading throughout the community. "This is still in the works," he said of the project. "There have been different designs and conceptions. ... [This is] a horrible Photoshop that was streamed in and is inappropriate, and I don't think anyone would want this in their community. ... We don't have a final product. If you present something that isn't final, you end up with all the misconceptions and a lot of the fear, the misinformation that people repeat." Somebody then asked Hemsted if "it was not true that construction was supposed to start in January, that was really not correct?" "At this time, we're still meeting with our consultants — there's so much to a project of this scope." Hemsted replied. "It doesn't happen overnight and we could work on this for a long time. " The January question was repeated. "Not that I'm aware of, " Hemsted replied. Somebody then asked if the Rancheria would support HARP in asking for an extension of time for the 30-day comment period. "That's something that couldn't be answered tonight. I'd have to take it back to the [tribal] council. It's just like a city council meeting. Everybody can go back to the council and have a discussion on it," Hemsted said, adding that he had heard a lot of inaccurate information. Hankin replied that all the information had come directly out of the EA, adding that he was concerned because the federal environmental review had begun, even though there were unanswered questions about the project. "The community wishes to become involved," he said. "We're trying to figure out how best to do that. If the EA process isn't delayed so that we can all talk this through, then we've got a real serious problem. So I would encourage your folks to ask for an extension." One of the Rancheria's representatives commented that the architects and the wastewater consultants are still doing their work. "Obviously the Rancheria doesn't want to pollute the streams. We don't want to hurt the environment and that is the reason why all these studies are being done," he said. "We're going to turn to the experts to get specific answers." "I don't understand how they can make an EA when they don't know what the design is going to be," a woman said just before the meeting ended. To read the EA, go to https://trinidad-rancheria.org or view a paper copy at the Trinidad Library. To comment on the EA: mail comments to: Regional Director Amy Dutschke, Bureau of Indian Affairs, Pacific Regional Office, 2800 Cottage Way, Sacramento, California 95825.